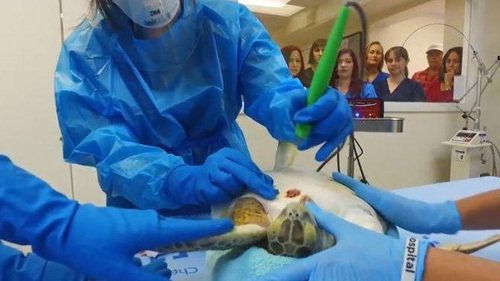 electrochemotherapy to treat two sea turtles with debilitating tumors in the Florida Keys, the first time the procedure has been performed on the species in the U.S. The juvenile green sea turtles, named Percy and Daley, have a viral disease known as fibropapillomatosis, which is chronic in their species worldwide. The condition causes tumors that form on the surface of their tissues and can grow to impede the turtles’ ability to see, eat and move. Percy and Daley were at the Turtle Hospital in Marathon, where they received the second of two treatments on Jan. 20 as the result of an effort spearheaded by Kyle Donnelly, D.V.M., a second-year zoological medicine resident at the UF College of Veterinary Medicine. Donnelly conceived of the project over a year ago and organized the collaborations needed to bring it to fruition. “The results we are seeing seem promising so far,” Donnelly said. Kyle Donnelly, D.V.M., and Anna Szivek, D.V.M., perform electrochemotherapy on a sea turtle at the Turtle Hospital. injection of chemotherapy drugs directly into the tumor site. practice in New York with significant experience in electrochemotherapy in other species, and Anna Szivek, D.V.M., an assistant clinical professor and veterinary oncology specialist at UF. used occasionally in other species but never previously in sea turtles in the U.S., is a potentially positive alternative. One tumor on each turtle was treated as part of the pilot Project. Impellizeri performed the first treatment with Donnelly in December using equipment he owns. The UF team arranged for Szivek to assist with the second treatment and borrowed another electrochemotherapy machine to complete the treatment protocol. he agreed to allow us to use,” Donnelly said. The UF veterinarians said they hope the college eventually will be able to purchase the equipment needed to be able to offer the therapy to different species as an alternative to surgery in certain cases. Donnelly said she felt the project, which she began “for fun” soon after starting her residency, would be a good way to highlight the strengths of UF’s zoological medicine and aquatic animal health programs in a way that would specifically benefit sea turtles. 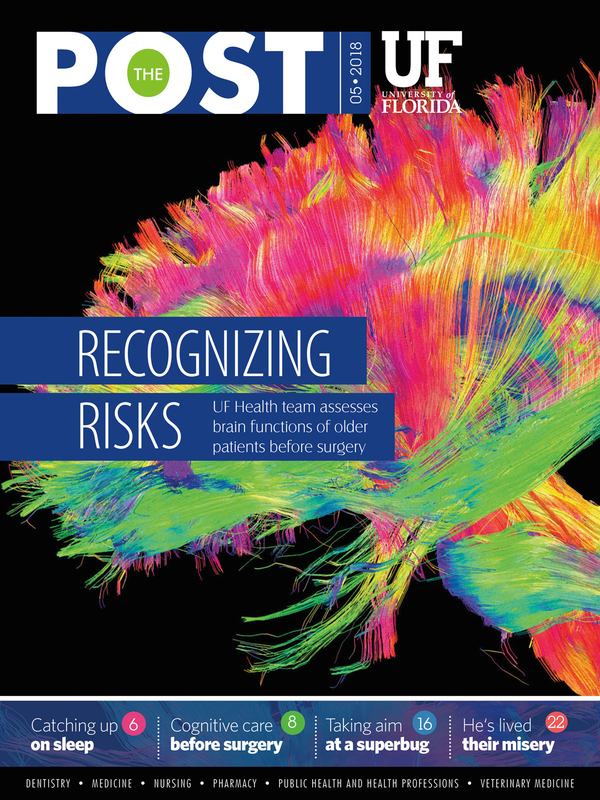 “Our team at UF brought the pieces together for the permits we needed, and the Turtle Hospital provided the funding,” Donnelly said, adding that she was especially grateful to her mentor, Nicole Stacy, D.V.M., a clinical pathologist associated with UF’s aquatic animal health program. Others who have contributed to the project include Terry Norton, D.V.M., of the Georgia Sea Turtle Center; Brooke Burkhalter, D.V.M., who is associated with the Sea Turtle Hospital at UF’s Whitney Laboratory for Marine Bioscience; and members of the UF veterinary medical pharmacy team, Donnelly said. “Treating these turtles was only possible because of all the awesome collaboration I’ve been lucky to get,” she said.